7-zip displays the column by default...just have to scroll to the right in order to see it. Thanks for the quick response. Unfortunately 7-Zip doesn't display the comment for this ZIP file. 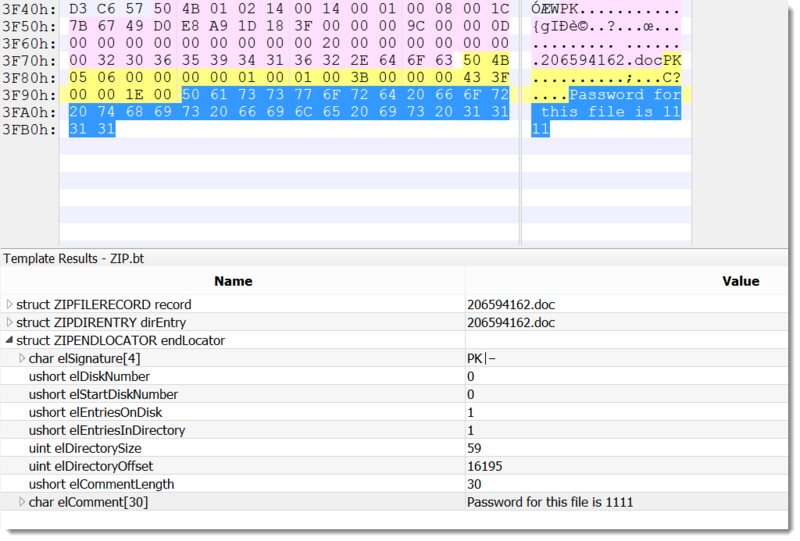 I think it's because you are referring to a comment associated with the embedded file, while in this sample it is a comment associated with the ZIP archive, not with a particular file inside the ZIP file. It does appear to be viewable in 7zip, but you have to access the "info" option at the top. WinZIP and WinRAR have user-configurable settings for whether to display archive-level comments at file opening. Thanks, but what application does this *by default*? By default Winrar shows archive comments in a window on the right hand side. Quoting DidierStevens: Thanks, but what application does this *by default*? I think peazip will show this information by default. Could it just be an artefact from the malware generation process? Thanks for the suggestions all. I'll test them with the sample. Update: WinRAR will indeed display the comment by default. This is a historic feature for Windows which utilized elements of WinZip and PKzip for its implementation for Zip files. The content remark element is enbedded in the code from Windows 98 and onward is my memory. It is an automated call to reveal remarks and such. (I don't know how. I just opened a zip-file I downloaded from a GIT-repo; shows comment, possibly with a hash-value).